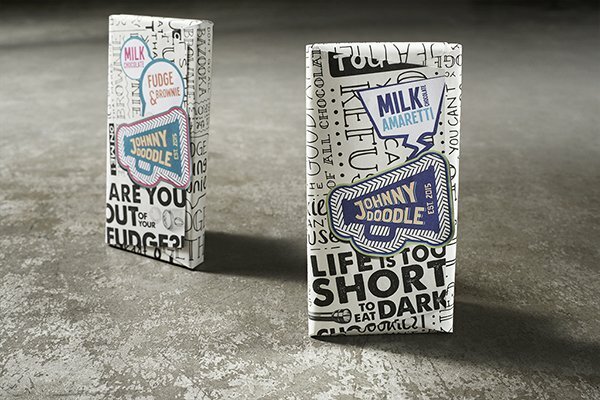 We love the new chocolate brand „Johnny Doodle“ from the Netherlands. Based in Amsterdam they manufacture delicious chocolate bars with a lot of creativity and finest ingredients. Fortunately our boss regularly brings some new packs of Johnny Doodle to the agency. The Packaging design is in a way naive and really playful so it is a pleasure looking at it while enjoying the sweet. The design really communicates the character of the brand and product. More of these fresh and tasty designs! They got also fudge in their portfolio and ….why are you looking at my bottom…great!